Silver Discoverer, the latest addition to the Silversea Expedition Fleet, has introduced a series of scuba diving opportunities on select voyages scheduled throughout 2014/2015. Karen Christensen, General Manager & Director Sales/Marketing, Australasia, says the Silver Discoverer itineraries will offer experienced scuba divers the opportunity to see Asia Pacific's top diving sites. "Asia Pacific is a scuba diver's paradise. Many of Silver Discoverer's voyages will provide guests with the chance to see this region from a different perspective. Among the 12 dive sites available as part of the select Expedition voyages, guests can discover some of the world's most exotic underwater species while exploring WWII wrecks and extensive coral reef ecosystems scattered throughout the lagoons of the Indo-Pacific," says Christensen. Silver Discoverer will visit regions such as the Solomon Islands and Palau Archipelago, which has been celebrated as one of the world's most spectacular diving hotspots featuring blue holes, hidden caves and tunnels, and an astonishing spectrum of coral fish and rare sea creatures. "Our Expedition team has carefully crafted these itineraries to provide our guests with the most awe-inspiring land and deep sea adventures. Silver Discoverer is designed to accommodate a variety of travellers, including those who choose to explore a world beneath the surface. A truly spectacular part of the Southern Hemisphere, these tropical waters really do tell a story of their own," says Christensen. Aboard Silver Discoverer, a team of experts including Marine Biologists, Dive Masters, Environmentalists, Ecologists and Geologists will be on hand to share their extensive knowledge of the region. 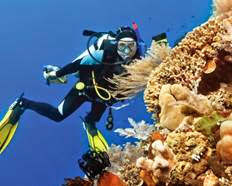 The following voyages offer scuba diving. Please check the Silversea website for further details.